Any member of the public concerned about their legal rights who has exhausted all legal routes in the UK can apply to the European Court of Human Rights. However, it is not straightforward and can take years for a case to be heard. But, for many, it is the last chance to see justice done. Countless individuals have used their right of access to this Court to prevent continued injustice and to change the law in their home country. Whether for or against the controversial influence that the European Court of Human Rights has, it is the last possible stage of appeal having gone through the domestic legal system to prevent or remedy a human rights violation. This guide shows how to apply to the court step-by-step and directs you to the relevant resources available. Why make an application to the European Court of Human Rights? How do I make an application to the European Court of Human Rights? What must I do for my case to have a chance of success? What are the incentives for bringing a case to this court? What remedies can I get? You could make an application to the European Court if you feel your human rights are being violated. Importantly, for the Court to consider a complaint as valid, that human right must be protected under the European Convention on Human Rights (ECHR): other legal instruments and conventions are not a valid basis for a complaint. So, it is important you know which article(s) of the ECHR you are relying on in your application. The ECHR is available here. The ECHR protects a wide range of issues which members of the public generally understand to be human rights. The court has also, for over half a century, added lots of layers of interpretation to the short text, and continues to do so. 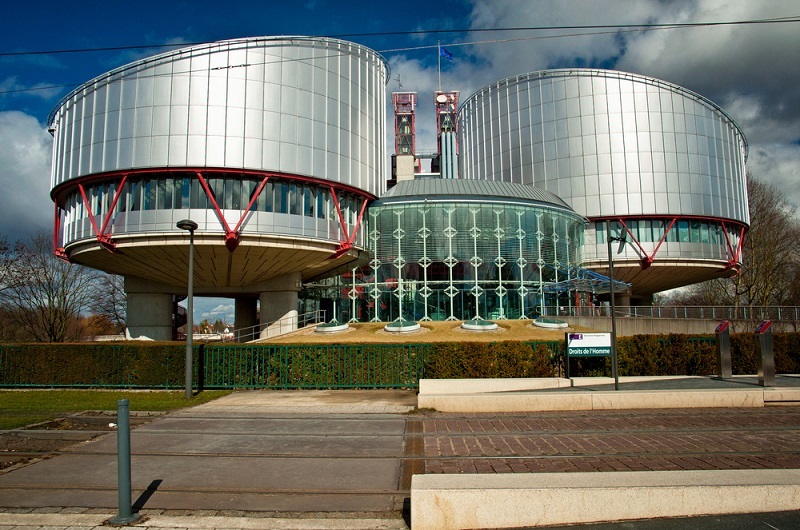 By looking at the Convention itself, guidance from the Court, and consulting previous case law, it should be clear whether you have an argument that a human right protected under the ECHR has been violated. The first step is to fill in the application form properly. Then you have to wait while it goes through various administrative filters at the European Court. It is then assigned an ‘admissibility hearing’. An admissibility hearing is where it is decided whether the case should be put before the Judges of the Court by checking whether the form has been completed properly and the legal issues have met the admissibility criteria. Assuming the case passes through the admissibility hearing, it can then be assigned a ‘chamber hearing’ where 7 Judges of the Court will consider the ‘merits’ of the case (in other words, discuss the factual and legal issues of the particular case). Depending on whether the decision brings up issues of real legal significance and importance, there may be the possibility of the case appearing before the final stage: the Grand Chamber (17 judges). Finally, once a decision has been made about the case by the Court, the Committee of Ministers (the ‘executive branch’ of the Council of Europe) will ensure that the judgments of the Court are enforced and implemented. The application form can be found here. 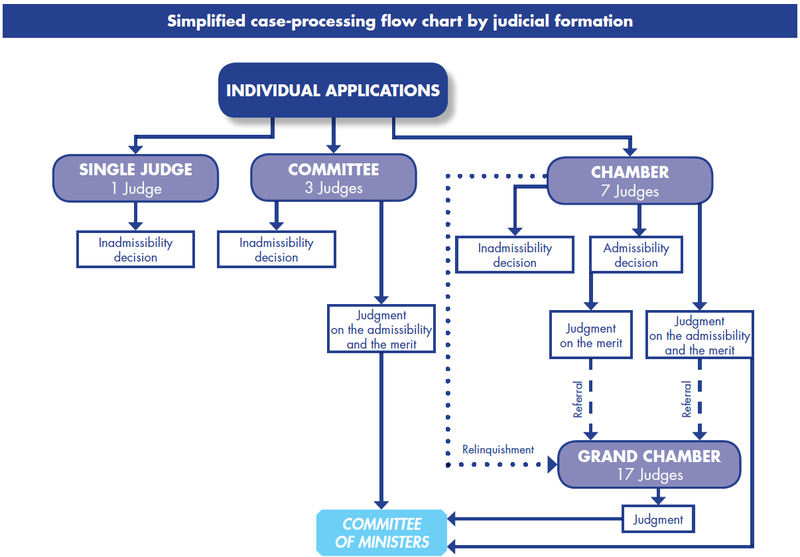 The form can be filled in without a lawyer or legal advice but it must clearly outline the facts, the alleged violation of a human right(s), a statement that the Courts in the home country have been used before applying and a description of these stages, and that all relevant documents are attached. More detailed information from the Court on how to fill in the form, including how to write it and where to send it to, can be found here. An application can be made by “any person, non-governmental organisation or group of individuals” who claim to be the victim of a human rights violation by one of the member states to the Convention. Victim could mean the person or people who are directly complaining of a human right violation. For instance, Joe Bloggs is beaten up by police officers employed by the State – Joe is a direct victim. A victim can also be an indirect, such as a close relative to someone who has a human right violated, or someone else with a close relationship. So, if Joe Bloggs was killed by the police, the mother, wife or somebody else in the family could claim to be an indirect victim of the violation of Joe’s right to life. Any application must be made against the appropriate member state (for most readers of this guide, that state will be the United Kingdom). You cannot bring a case against your next-door neighbour, for example. For an application to be considered, the member state must have allegedly failed in their duty to protect a human right. The introductory guide in this series outlines in greater depth how a state may be responsible. The court provides an interactive checklist showing what is needed in an application. You should check this, as well as the Court’s guide (available here), before sending your application. There is also a 90-page document which explains why an application may be unacceptable and proceed no further through the Court system (available here). Exhaustion of domestic remedies: this means that all relevant courts and internal complaint procedures in the UK must have been used before applying (unless there are exceptional circumstances or “no real prospect of success”). Following this, an application must be made within six months of the final decision. The date of the postmark recorded on the application will be the time used by the court. Applications must not be anonymous: the applicant must provide sufficient details to eliminate doubt as to who they are and it must be signed by the applicant’s representative if he or she has one. It cannot be a redundant application: in other words, if the complaints and facts are identical to an application already made then it will not be accepted. It will not be accepted if it is “manifestly ill founded”. This includes misleading the court, if offensive language is used, if it is vexatious/devoid of real purpose, etc. Incompatible ratione personae: the alleged violation needs to have been committed by the state or be in some way related to it. Incompatible ratione loci: the alleged violation must have taken place within the territory or jurisdiction of the state (which is the ‘respondent’ in the application form). Incompatible ratione temporis: it will not be accepted if the case applies to facts or acts which occurred before the ECHR came into force. Incompatible ratione materiae: the right relied on by the applicant must be protected by the court (in other words, it must be a right protected under the ECHR). If “no significant disadvantage” arises then it will not be accepted. This is based on the idea that an alleged violation must reach a minimum level of severity for it to be considered by this international court. It is also important to be familiar with the ‘rules of court’ which govern everything from how to communicate to the Court, how to change or amend pleadings, the relevant time limits, and how to conduct yourself in written and oral proceedings. These are available here. There may be times when someone needs the Court to act far more urgently than it normally would. If so, interim measures may be applied, but only where there are exceptional circumstances and where there is a real risk of serious and irreversible harm. Generally, the Court will act more urgently when the case concerns the removal of a person from one member state to another country (this normally falls under either Article 8 (right to private and family life) or Article 3 (prohibition on ill-treatment)). In these circumstances, it is usually the last method available and a chance for people to appeal against a decision to remove them. This highlights just how serious the case needs to be for interim measures to be granted. Rule 39 of the rules of court provides the avenue for making an application for interim measures. The applicant needs to apply to the court for interim measures (usually a separate letter attached to the application or sent separately). The court decides whether to grant it and then sends the decision to both parties. The decision cannot be appealed and it only provides interim relief for this particular issue; it does not mean there has been a violation of a human right or that the ban on removing a person is permanent. But it is a valuable tool for many people throughout Europe who find themselves in this situation. So why go through all these stages and hurdles? There are many reasons: some may do it out of principle; some may want to see the law changed; some may desire an investigation; and some may want financial compensation. The Court’s decision cannot directly change the UK’s law, but in most cases the UK will alter its law as a result of a decision made by the European Court of Human Rights. This may provide personal justice, as well as justice for others in a similar position. Many cases brought before the court from other countries (and also from the UK) are situations where family or loved ones try to find the truth about why someone they cared about was killed under the protection or supervision of state authorities. The court also has the power to award what is known as ‘just satisfaction’ (under Article 41 of the ECHR). Normally, this is a monetary sum paid by the state to the victim(s) within a certain time period. This can include the cost of legal representation, damages and interest. Importantly, the court demands that expenses are itemised and presented to it. A more detailed factsheet on just satisfaction can be found here. There are clearly a vast number of steps and issues which need to be complied with to apply to the European Court of Human Rights. This court is used by 47 different countries and the application process is the same for each. It is a process which is designed to be accessible through the language barriers, as well as the legal, political and cultural differences. This guide is not a DIY guide for applying, but it does provide an introduction for how you can bring a case to the court without a lawyer; something which many applicants do. This is a Court which provides a final chance for people to uphold their human rights and the system is designed to try to not disadvantage those who do not have the mammoth resources of the defending government.